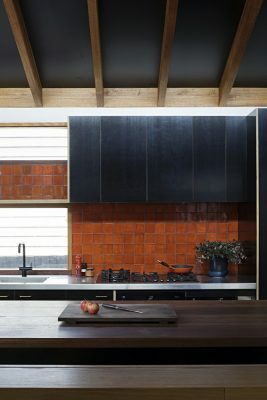 The age-old adage that the heart of the home is the kitchen could not more true for this family home located in Fairfield, Melbourne. The client, Scott Pickett is a celebrated chef and restaurateur who, along with his partner Bec, wanted to create a home for their young family with three children where life revolved around the kitchen. Where living and the joy of preparing and sharing meals occupy centre stage, involving the whole family and friends. 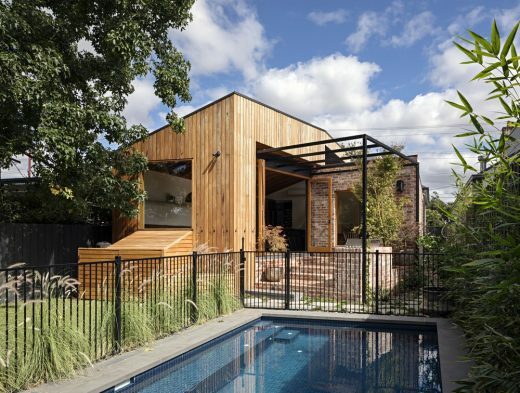 Rathmines House is an alteration and addition to a Victorian weatherboard house in Fairfield. 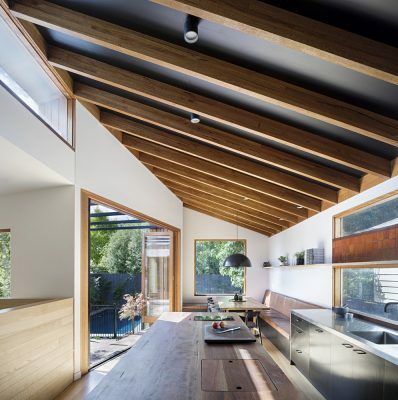 The poorly planned layout of the existing dwelling contained a lean-too out the back, housing the laundry and bathrooms to the north and living spaces to the south. A narrow corridor provided the only connection to the backyard. MRTN’s proposal removed the lean-too and replaced it with north-facing living spaces and created a connection from the front of the house through to the green spaces of the rear garden. 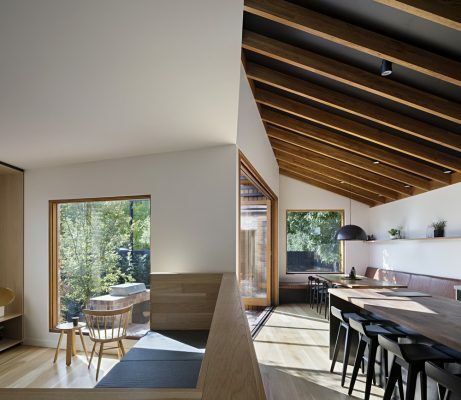 MRTN eschewed an ‘open-plan’ type addition and instead proposed an ‘L’ shaped arrangement with the kitchen occupying a central location between the dining and living spaces. 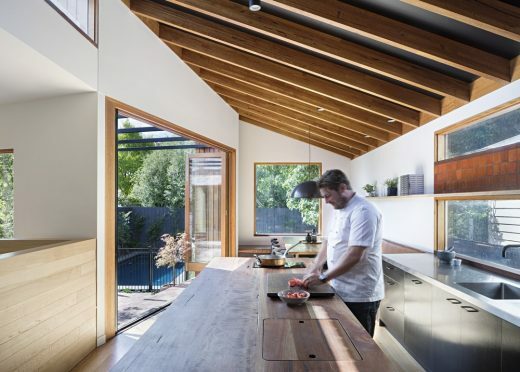 The kitchen itself is generously proportioned, relative to the modest scale of the project, and is centred on the solid Spotted Gum countertop of the kitchen island. An oversized built-in sofa that was inspired by the furniture design of Donald Judd separates the kitchen and living room. In the tightly planned spaces the sofa provides two functions: at 3.7m long it provides generous seating for the whole family to watch TV while at the same time acting as a partial height wall to separate kitchen from living but maintain visual and physical connection. 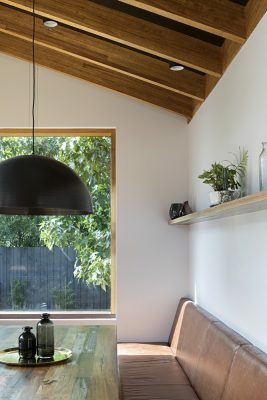 When guests come to visit the counter height top to the sofa also provides a handy space to rest your elbow or drink, as others are busy in the kitchen. 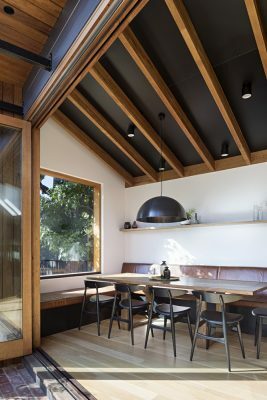 Restaurant style banquette seating extends from the kitchen bench, wrapping around the end of the addition and above, an over scaled window frames views to the neighbours tree. 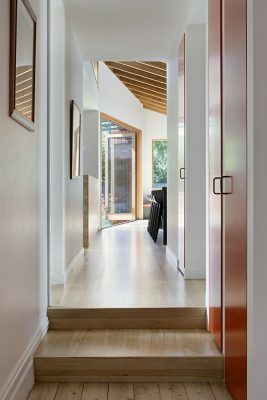 A flexible study / guest bedroom was included adjacent to the living space with a floor to ceiling surface mounted sliding door offering privacy when required. 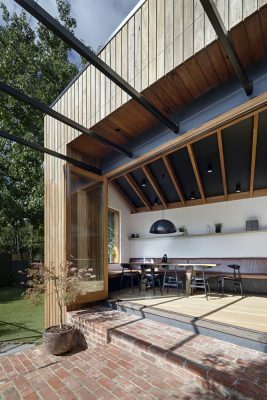 From the garden the extension is designed as a pair of interlocking volumes, a pitched timber clad wing that overlaps a smaller mass of salvaged brick. 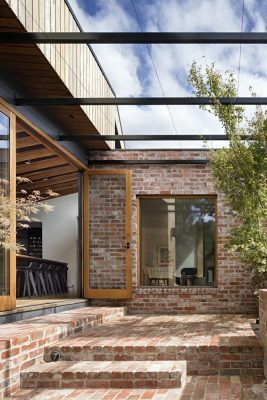 At the fulcrum between these two volumes is painted steel pergola set on a base of salvaged brick creating a seasonal outdoor room. In summer overgrown with a grape vine and in winter left bare to allow low winter sun deep into the living spaces inside. 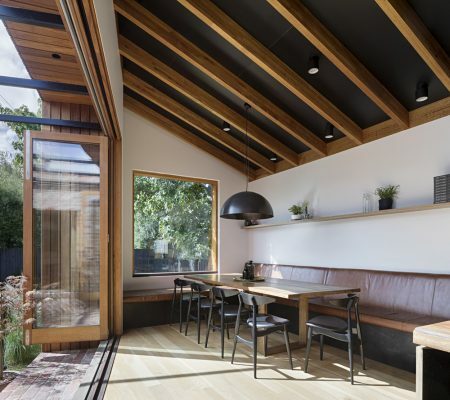 The historic timber bungalow was renovated, re-roofed and returned to its original condition with the addition of some raised planter boxes in the front yard to supply Scott’s restaurants with seasonal produce. Internally the original house was re-modelled to create bedrooms, an ensuite, bathroom and laundry. Along with much needed, and appreciated, storage along the corridor.